Were you just as surprised as me when folks started proclaiming it was the first day of fall? What? Weren’t we just at the pool soaking in the rays or on the boat with the breeze on our faces. I’m so in denial that the cool weather will be upon us soon. Because, of my oblivion, I’m was so glad At Home Stores was on the ball and presented an opportunity for me to add a touch of fall trimmings to my home decor. Requesting the assistance from a dear friend, we embarked on a road trip to the nearest At Home Store. This was her first trip to this great mega home goods superstore. If you are looking for ideas to decorate your home, you will definitely be inspired by the extensive variety At Home provides. After spending a productive couple hours wandering the store, we left with some great fall trimmings, enough to fill the back of my vehicle. I bet you would like to see what I purchased. I know, that’s the fun part. However, I’m only going to give you a sneak peak in hopes you will stop back on Oct 3. 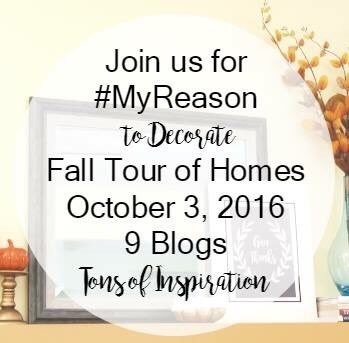 Thrifty to Nifty and 8 other blogs will be sharing #MyReason to decorate for fall. 9 Fall Home Tours will feature #AtHomeFinds that hopefully inspire you to to find a reason to decorate. I could not pass up this vintage inspired, distressed candelabra. It’s neutral creamy white color I knew would work perfect with the color scheme I’m attempting to incorporate in my fall decor. Being that it’s low in height would allow for easy viewing across the table and the spaces for multiple candles will provide the right amount of lighting and ambience. 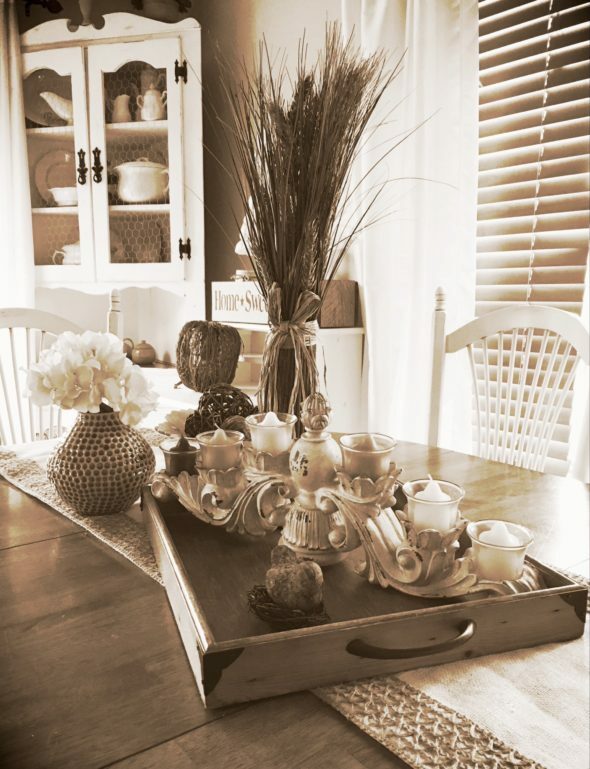 This homey, warm feeling is #MyReason for creating a welcoming dining area. I would love for you to share how you’re decorating for this new season. It just seems a natural transition for changing out our decor. Don’t you agree? Love It! Don’t forget! Stop back October 3. See you then! It’s really easy to spend a couple hours in the At Home store isn’t it! Looking forward to Oct. 3rd. You really did fill up the back of your vehicle. Love that rug! Oh, I can’t wait for October 3rd! Your teaser looks beautiful 🙂 I wish I had At Home stores near me. I’m getting excited for the full tour now! Love your sneak peek! I’m looking forward to seeing all your decor. Your sneak peek is gorgeous and I love browsing the aisles of At Home.